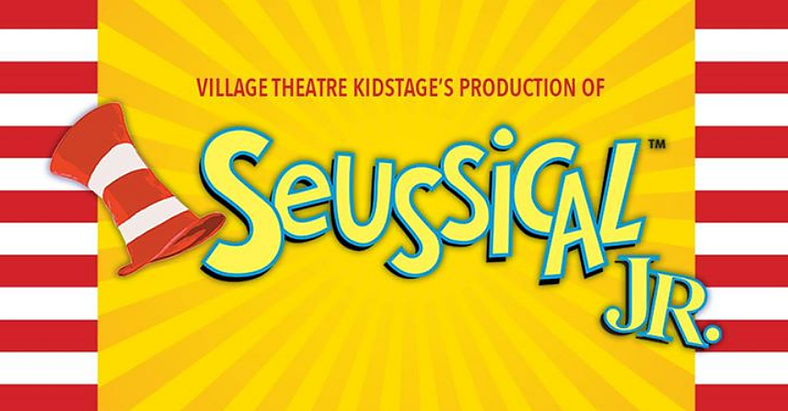 Village Theatre Kidstage: Seussical Jr! What a lovely, lively play for young audiences! Village Theatre’s Kidstage never disappoints, and this production of Seussical Jr is spunky, fun and full of unexpected moments. This Seussical is not the bright colorful Truffula Trees and specks on a clover – instead, Sheady Manning, the director, imagined a modern day Seussical that reflects what our kids go through at school and out in the community. The “Clover” in this production is a Teddy Bear, and poor Clover goes through some rough moments! While this take on Seussical may require some explanation for younger audiences expecting the usual Seussical, the show is full of delightful moments, wonderful singing and dancing by an energetic cast. There are not a lot of moments that may bother those with Sensory difficulties- the lighting is soft and beautiful throughout most of the show, and the singing, while lively, is not likely to bother those with auditory sensory difficulties for most of the show. There are mild themes of teasing and bullying, but they are done tastefully and are somewhat subtle, the most aggressive scene is right before intermission where Clover gets tossed around a bit.